The constant use of playground equipment means that it can become damaged and in need of repair at unexpected times. It is because of this that regular inspections of your equipment is vital in ensuring that it remains safe for children to use, as well as helping to keep it lasting for as long as possible before needing to be replaced. If you are unsure of how often to inspect your equipment, as well as what to look for during the inspection, this post will help to provide you with all the information you need. Inspecting your equipment on a regular basis is vital in spotting damage quickly. The exact frequency of how often you inspect your playground equipment will depend on how regularly and the number of children who use the equipment. As a rule, however, no less than once a month should ensure that you are able to notice any damage before it becomes dangerous or beyond repair. 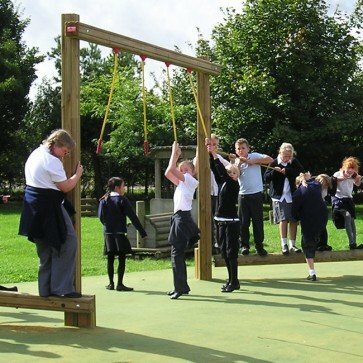 As well as this, inspecting your equipment after a period of extremely bad weather, particularly after strong winds, heavy rain and snow will mean that you are able to notice any damage caused by the weather; because although playground equipment is designed and manufactured to withstand these types of conditions, it is still vulnerable to damage. When inspecting your playground equipment it is important to know what to look for. Any obvious damage and broken equipment will be easy to spot, however it is the small and easy to overlook the parts showing initial signs of wear that need to be spotted during an inspection process as well. When inspecting your equipment make sure that you look for these small damages, especially in joints. As well as this, pay special attention to more vulnerable materials, such as ropes, which can become damaged through constant use and harsh weather conditions. During the inspection process take notes about which equipment is damaged and where so that you can find the right spares to repair the equipment. You should also note down areas that are becoming worn so that you are aware that these pieces of equipment need extra attention to ensure that they continue to remain undamaged and safe to use. Once you’ve done your inspection you will have an idea of which equipment is damaged and needs repairing. The next step is to source a replacement part and fix the equipment as quickly as possible. At Online Playgrounds we offer a wide range of equipment spares to make it easy to find the right replacement for your equipment. The majority of our spares are easy to fix into place so do not require technical assistance to replace damaged parts. In addition to this, our spares are designed and manufactured to a high standard, so that you can be certain that the replacement will be able to withstand years of use in all types of weather conditions.